Excellent in multiple use, the most advanced model in their class. Why is KIWAMI so "ULTIMATE"? The lightest handpiece in the 90W station class (25g). Thin, very pliable cord. The powerful output heater enables wide variety of soldering. The built-in thermocouple located on the surface of the soldering tip (LA method) enables an instantaneous recovery during the operation. 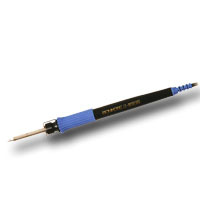 The iron tip slip-resistant stopper for stable soldering. ESD safe design. The iron tips and heater elements can be replaced separately for economical use.